Interests - Loves fire engines and fire services, Harry Potter, plays football for local disabled football team and Play Stations. Jon Paul was diagnosed with Cystic Fibrosis at 13 days old. He was born with perforated bowls, distended tummy; he died twice but was brought back to us. He wasn’t expected to live until he was 3, now he is 15. He also has Cerebral Palsy. He is fire services mad, loves anything to do with fire engines and has been to New York, San Francisco and Washington to visit their fire stations. He has also been to London and is now a member of the London fire service. He has 209 fire badges from around the world, helmets, T-shirts and lots more. He is also football mad and supports Sheffield Wednesday and plays for the Plymouth Argyle disabled football team. Jon Paul has to go into hospital for 2 weeks every 3 months for treatment (IV antibiotics) and has a Gastrostomy tube in his tummy, Portacath in chest and splint on his leg for his Cerebral Palsy. Yet through all this he remains positive and likes to help other people, he has a positive outlook on life and will not let his disease get him down. Jon Paul came out of hospital after 6 weeks on Friday but has been read lighted as he was coughing up blood. He has not been allowed home as his lungs are so bad. He really needs those new lungs and in the mean time please let’s try get lots of smiles sent to him. Just to let you know that Jon Paul had another call from Harefield Hospital at 2am this morning. We got there at 7am and he had to have a lot of tests but at 2pm we were told it would not go ahead. He is still hoping maybe it will be 4th time lucky. Fingers crossed. Jon Paul is expected to come out of hospital this Friday depending on his lung function, so we are hoping it happens. Just to say hope you are all well. I am sorry that we have lost one of our Pals, it is always a shame that we have to leave this earth but we all know that God will be waiting for us on the other side. I never thought I would say this but I am beginning to lose confidence in myself, as since the 30th December I been in and out of hospital like a yoyo. I am here again for the next 2 weeks because I have a chest infection. Doctors have said this is how it is going to be from now on, I am going downhill as they say. I want to prove them wrong though, I just need a double lung transplant. When that will happen, I do not know, but I will not give in. Anyway please stay POSITIVE and not NEGATIVE, I am just fed up with being here all the time. JP has just come out of hospital this Friday. He had been in since the 30th December. He also now has to use a wheelchair to get around as he cannot get far without his oxygen. We’re still waiting for a double lung transplant and we’re going to Harefield Hospital this Friday for more tests. Thank you for sending him post. Jon Paul had a call on the 20th October for a new pair of lungs. When we got there and he had some tests it turned out that the antibodies did not match though, so we had to come home again. However, at least we know what to expect when the phones rings again. Thank you for all Jon Paul’s lovely post and we hope to do some more fund raising again this Christmas for Post Pals. Hi everyone it is nice to be able to email again now that mum has got back her computer and I am ok to use it. At the moment I have come home from hospital for a couple of hours so am making the most of it. I would like to say thank you to all the nice people who have sent me fire engine magnets and bus ones as it is so very nice of you. I hope that you are all looking after yourselves, and yes, being POSITIVE about your illness and not NEGATIVE. Please take care of yourselves and I will email again soon but in the meantime I must get back to the hospital for more physio and medication. Bye for now. Once again I have been admitted to hospital today as my lung function has gone down and so has my weight, so I am in hospital for the next 2 weeks. Hi Post Pal friends. How are you all doing? I hope that you are all well and looking after yourselves. I am still fighting my C/F and still on constant i/v treatment (at home though so that is not so bad). As you all know I love fire engines and I am after some fire engine magnets but I am also looking for some magnets of buses to go on my project that I am working on at school. Can anybody help me please? Also, I want to say please be positive about your illness and not negative – I know I always say this but I am sure that it helps, so please take care and look after yourselves. Hi to all my friends on Post Pals, I would like to say thank you to all of you that sent me a birthday card. I was just happy to be out of hospital for it. I had a lovely day, I went out for a meal with my family on the Sunday at a Spanish La Tasca restaurant. I ate squid and anchovies with white fish and chorizo and also had savoury bread with different oils to dip it in. Quite nice. Then on the Monday I went to Bingo for the first time with my mum but won nothing. My mum won twice and my two uncles won once each but I enjoyed myself. Also thank you for the cards that were sent to me while I was in hospital with all the nice chocolate that came with them too. I hope that you are all well and looking after yourselves. But as always, please be POSITIVE and not NEGATIVE about your illness, and in the meantime take care and I will message again soon. Hello Post Pal friends. I am just updating you on how I am doing. I am still in hospital but getting a little better. My weight up by about 3oz and lung function is ok. Hopefully I will be out for my birthday next week, but if not I’ll just have to grin and bear it. Hope you are all well and taking care of yourselves. Sorry everyone, I spoke too soon. I have to go back into hospital today as my saturations level has gone down and I have lost weight. My lungs are also not too good either. So my c/f nurse has said I am to go back. I will let you know how I am getting on or my mum will. In the meantime take care and look after yourselves. Remember be POSITIVE not NEGATIVE about your illness. Hi to all my Post Pal friends. Sorry that it has been such a long time but I have been in hospital again for the last 3 weeks (out now though). Just thought I would let you know some good news. I went to Harefield Hospital yesterday to see my doctors about my double lung transplant. It was only a checkup but they are happy for me as I have been able to put on weight and I now weigh just over 7 stone (51.2 kilos I think), so they hope to see me in another 6 months unless anything happens before then. I am so happy so I thought I would tell you all and I am sure it is because (yes, you know what I am going to say) I REMAIN POSITIVE NOT NEGATIVE about my illness. Please remember this and I am sure it will help you all to cope with your illness. Just to say thank you to you all who are sending me some nice cards and gifts. I have been told today that I will have to be in for another 3 weeks. They have changed my medicines around again to see if that will help me, but the thing is I keep being sick and am losing weight again. I will not let it get to me though; I am still fighting it all the way. My doctors and nurses are a great team and are doing a good job of looking after me, they are more like friends than nurses, but my mum is doing her bit by making them cakes. I must say thank you to Jenny who sent me a recipe for mars bar squares, the nurses love them so much they have now got the recipe from mum. Anyway, please take care of yourselves. Hi to all my Post Pal friends. Just to let you know that I am back in hospital again as I have got another chest infection, my lung function is very rubbish, and my weight has gone down quite badly, so I guess I need to eat more chocolate. I am going to be in for about 2 weeks again, but hope to be out by the 23rd July as I am doing a charity football match with all the c/f doctors, nurses and physios from my hospital, and also the physios and the people from MEMS who mend all the machines (I think). The best part is I am the referee and they all have to come as garden characters or they will get a fine. All money raised will go to the c/f trust. Anyway, I am thinking of you all so please be POSITIVE and not NEGATIVE about your illness. Get on with life as best as you can and do not let it beat you. Take care and look after yourselves. Jon Paul is back in hospital again. He has got a very bad chest and Laryngitis. He will be in for 2/3 weeks and he has asked me to tell you that he will remain POSITIVE NOT NEGATIVE and that he wishes you all well. Just to let you know that Jon Paul has been told that he is now on the lung transplant list and has been activated. Now all we have to do is wait for the phone call. This is a serious operation (a double lung transplant) so we are pushing all the chocolate and high calorie food into him as fast as we can. Thank you for all the cards Jon Paul has received. He has also had lots of chocolate and gifts from Post Pal friends, including Thorntons chocolates which he has yet to tuck into. Hi just to let all my Post Pal friends know that the doctor has decided to keep me in for another week and it will be my fourth. They want me to put on weight as I am not heavy enough (only six and a half stone). They are giving me lots to eat and I must have something every hour to help me get heavier so I’m eating lots of chocolate. Mum said she needs to take out shares in Cadburys chocolate – I tend to agree with her as the more calories I eat the better. My lung function has improved a bit though so I am happy with that. I hope that you are all well and looking after yourselves despite this horrible weather we are having and in the mean time, please be POSITIVE and not NEGATIVE about your illness. Just to say that Jon Paul is still in hospital and I have had to remind him that he must stay POSITIVE as he is feeling really down at the moment and fed up with being ill all the time. I would like to say a big thank you to all those friends and Pals who have sent him letters. I know that he likes receiving them and enjoys reading them. Just a few words to let you know that Jon Paul was admitted back into hospital very poorly again. He has not even been out 2 weeks yet. He went for a check up and the doctor said ‘I am sorry Jon Paul but your lungs are very bad again so I am admitting you again.’ I am in shock but have to pull on my energy from somewhere to keep him going. I will let you know how he gets on but it could be a long haul for him. Hi everyone, just to let you know that I am out of hospital for the time being. The doctors were happy for me to go home, only I have to go back again soon for checkups. I have been given 2 new machines to bring home and mum is just wondering where she is going to put them. One is a Bipap machine to help with my breathing at night time and the other one is called a yanker to help me with my sputum. So I am POSITIVE and not NEGATIVE as I say to you all and I am sure that this attitude is helping me. I would like to thank all Post Pal friends that sent me get well cards and gifts. I will email again soon but I’m just going to watch the football match on telly now. Take care of yourselves. Hi, its Jon Paul’s mum again. He has taken a little turn for the worse. They think he could be in hospital for a month to 5 weeks. He is on a bipap mask to help with his breathing but is still finding it very hard to breathe. His dad and I are taking it in turns to be with him at night as he is very frightened. I will let you know how he gets on. Hi this is Jill, Jon Paul’s mum. Just to say thank you for all the gifts from Post Pal friends. Unfortunately, Jon Paul is unable to unwrap them as he has been taken into hospital today (5.30am this morning) and is very poorly. I will let you know how he gets on after Christmas. In the meantime, take care and have a good time. Hi to all my Post Pal friends. Sorry that I have not spoken in a long time but I have been to Harefield Hospital to have tests on my Lungs. I am going on the transplant list in mid February to have a Double Lung Transplant but first I have to put on some weight and I am also Anaemic so need some Iron tablets. I have sent some cards to you and only hope they get to you in time. Well despite this weather I hope that you are all remaining positive about your illness and not NEGATIVE. In the meantime, take care of yourselves and look toward the future. Also have a great Christmas and New Year. Hi this is Jon Paul’s mum. I know that he wrote you all a little message the other day but JP was rushed into hospital last night having difficulty with his breathing. He was admitted about 9.30 pm and I don’t know how long he will be in there. I just thought you would like to know if you would like to say a prayer for him. In the meantime from me, please look after yourselves and we will email again when he comes out. Hi to you all. I hope that you are all getting excited for the next month and that you are all being positive about your illness. I am looking forward to this month coming as I will be an uncle and I intend to spoil the baby. First I must go to Harefield Hospital in London though and see about this lung transplant assessment at the beginning of December and then we will take it from there. I have not been too well this last couple of days and have had a lot of coughing fits. My mum is doing extra physio on me and I am going on the vent also, but hey, I can cope, I think. Anyway, I just want to say hi to you and wish you all well. My thoughts are with all the people that we have lost on Post Pals and I think of you all. Hi to all my friends at Post Pals and just to let you know that I am thinking of you all. I am in hospital at the moment doing my second week. The doctor wants to keep me in for another week because I have not been very good with my results and blood tests. I’ve got to have more x rays and a scan but I will come through like I do and will not let it get to me. I hope you are all well and looking after yourselves. Remember be POSITIVE about your illness not NEGATIVE. I will email again soon when I get out of hospital. Hello to all my friends. I am sorry that it has taken so long to speak to you, only I have not been well and now I am to go back into hospital again on Monday for more I/V treatment. This is to get me ready for Harefield Hospital which I have to go to in December for 4 days of tests to see if I can have a lung transplant. Apart from that all is well; I’m doing some more fund raising in December for Post Pals so I hope to raise lots of money again. Well, I hope you are all being POSITIVE about your illness and not NEGATIVE as I always say to you. I think of all my Post Pal friends all the time, so hang in there friends and take care. I would like to thank you all for my wonderful birthday cards and gifts. I would like to email the lady who sent me the boot monthly card (my dad thinks it is brilliant), mind you I had a lot of football cards. Thank you for them all. I have been to Harefield Hospital and have been told I am suitable for a lung transplant but I still have to decide, so I’m busy thinking about it and will let you know soon when I have made up my mind. Until then, be POSITIVE NOT NEGATIVE ABOUT YOU ILLNESS and take care. Hi to you all, just to say that I am being discharged from hospital on Friday yeahhhhhhh. Looking forward to going home – it has been a real hard time and I am sorry for scaring my sister and parents and want to say thank you to all my Post Pal friends and to say thank you for all my cards and gifts. Thank you. Just to say that Jon Paul is starting to look like his old self again. We still have to stay in hospital for another 2 weeks but he is making progress. The doctors have said that he scared them and he put the fear of God up me and my husband, but I’m glad to say he has come through the worst of it. He would like to say a big thank you to all his Post Pal friends who have sent him cards and gifts. He’d also like to say hello to Sarah G to thank her for the fire stuff she sent him and to Bethany who has been nominated as his best friend. I will keep you up to date on how things go but in the mean time be POSITIVE not NEGATIVE about your illness, as Jon Paul likes to say. Hi this is Jon Paul’s mum again. Just to let you know that we have an appointment for Harefield Hospital on the 27th August for a pre assessment, maybe for a lung transplant. We will have to wait and see what they say but it is also 2 days before his birthday. It will only be for one day but will take some time for all the tests to be done. I will let you know how he gets on. But in the meantime, take care and look after yourselves, and be POSITIVE not NEGATIVE about your illness. I have been told to say this by Jon Paul. Jon Paul has picked up a little bit but doctors say it is going to be a long haul in hospital for 4 to 5 weeks. He (or rather I) would like to say thank you to all the kind people and children who have sent him get well cards. I will let you know how we get on soon. Hello this is Jon Paul’s mum. Jon Paul is still very ill in hospital; he is fighting it, but not winning at the moment. He is very tired and just wants to sleep. All I ask is if you can say a prayer for him this will help. I will let you know when he is any better, but as Jon Paul says, stay POSITIVE about your illness not NEGATIVE. Jon Paul is very ill in hospital. His breathing is very rapid and he is on a bipap face mask to help with his breathing. He is going to be in for at least 3 weeks and I will let you know when I know more. Hi everyone at Post Pals. Just to let you all know that I have to go back into hospital again on Friday (23rd July) because my lung test was at the lowest that the doctor has ever seen it. I said that I will come in next Friday afternoon and then I said to him that after 2 or 3 weeks of iv’s, I will come out of the hospital so fit that he will not know what to say to me. Hi I would like to say thank you to the kind person who sent me the Sugglie, it was so very nice of you. Thanks also to the person who sent me the Football Team members of England, it was nice of you. There are so many nice people out there that care. I care for other people even though I am ill myself too. Thank you again. Jon Paul came out of hospital 2 weeks ago and decided to do his last lot of IV at home so is getting no sleep because some of them are done at midnight or just after. He is feeling OK but not 100% still and this hot weather makes it harder for him to breathe properly. He has something to work towards now as his sister is having a baby in November so he will be Uncle JP. Just to let you know that JP comes out of hospital next Monday but will have to do the third week of I/V treatment at home. He is looking a little better and has put on about 6oz in weight and his lung function is up to 27% so we are half way there. If we can get it higher he may still get the chance of a lung transplant. Here’s hoping. I will let you know more sooner or later. Message from Jon Paul: Thank you to all the friends who sent me get well cards and to Helen who sent me a fire bear which I took into hospital with me. I also took my old one but it is getting rather tatty now. I will still keep him though. Thanks to you all. Hi this is Jill, Jon Paul’s mum. Just to say that he is now in hospital (went in today). He is not at all well so they have started him on his i/v straight away. It took a bit of time to get the needle into his chest but it went in after the 4th attempt. It will have to stay there for a week then be taken out and another put in the following week. As you all know though, he remains POSITIVE and not negative. Hope you are all well. Please can you say a prayer for Jon Paul. Normally I would not ask this of anyone, but I am really worried for him. Just to let you know that Jon Paul is going into hospital next week for 3 weeks. I will let you know how he gets on. Basically, what the doctor is saying is that his lungs are really bad, so it’s another visit to the hospital, even though he has only been out for about a month. Jon Paul is not very well, he has a really bad headache and the doctors are not happy with him again. His sats are down but his weight is up a little. For him to stay home from school, he must be really bad. Nothing keeps him out of school usually. He went to hospital yesterday and has managed to stay out this time, but has got yet more tablets to take. We will be able to rattle him soon as he has that many. But he still insists on staying positive and not negative about his condition and he hopes that all the other Post Pals feel the same way. He sends his love to you all. Hello to all my Post Pal friends. Just to let you know that the rain held off and the Mayfair went ahead. Mum, Rachel, and I, raised ¬£90 for Post Pals. Hope you are all keeping positive and not negative about your illness. Keep up your good work. I am in hospital again as my Lungs are very poorly and I have lost 5lb in weight, so the doctors are not happy with me. I have only been off my IV treatment 3 weeks (which I did at home) and now here I go again! The doctors want me to stay in hospital for 2-3 weeks and try a new medicine. You all know me though, I will come back fighting and will not let it get the better of me, so if you are ill then hang on in there and do not give in to it. It is fighting talk I know, but what would happen to us if we all gave in to our illness. I know we have our mums and dads to help us, but with POSTPALS we also have each other. I hope you all get well or stay well. Hello to all my Post Pal friends and a special hello to Sophie and her sister Jessica. I hope that you are all being positive about your illness and not negative, although I am a fine one to talk like that just now as I am quite poorly again. I’ve only been out of hospital one month and I have got another lung infection so I’m back on IV treatment again. My lung function is only 88, I have lost more weight and my sats are quite low, so doctors are not very happy with me. I will bounce back again though; I am not ready to give in yet. Apart from all that, I wish to say thank you for all my cards and gifts and hope people like the ones I sent to them. Pease take care and look after yourselves, I wish you all well. Firstly, I would like to say thank you to everyone who has sent me cards wishing me well and to all the other friends who have sent me parcels. I will write to you all in person to say thank you, but this will be when I come out of hospital. I am hoping that it is going to be Tuesday of next week, it depends on my lung function test and if I have put on any weight. They are giving me this stuff to drink to help with my weight BUT MY GOD IT IS DAMN AWFUL! Anyway, I am alright, so I keep telling myself (as I have said) I am positive not negative about my illness, but hey, I have to carry on and make what I can of my life. I hope if you are ill that you are looking after yourself. I am thinking about you all. Jon Paul is in hospital with a sever lung infection and we do not know how long he will be in, but he is hoping it will not be too long. I will keep you updated with how he is. In the meantime, it is my turn to say be positive not negative about your illness as I know that Jon Paul would like me to tell you this, so hang on in there. Jon Paul is in hospital with the flu at the moment and has been really poorly over Christmas. Thank you to everyone who sent him post over Christmas. Hi this is Jon Paul’s mum, I know that he would not like me to tell you this but he is under the weather and feeling rough. He has had to go on another course of tablets due to an infection, something to do with the air, and he also now takes 62 tablets a day. As you all know, Jon Paul will not let it get him down and would like to say please remember my motto, think positive not negative about your illness and hope that one day there will be a cure for all lifetime illness we are living with. Jon Paul would also like to say a very merry Christmas to you all. I would like to wish all my friends on Post Pals a very happy Christmas and I also want to wish all the staff at Post Pals a merry Christmas and New Year. You are truly an inspiration for all of us and I am sure that from all of us Pals we would like to tell you that we love you. You are all very good and if we had an award of some kind then you would receive it from us. Maybe someone could come up with an idea but in the mean time MERRY XMAS AND NEW YEAR. Just to let you know that tomorrow I will be helping mum to raise funds for you all at the local Christmas Fayre. It might not be a lot as they have forecast more horrible rain but here’s hoping. Hi to all my Post Pal friends. I just thought you would like to know that I won the Heart Radio Pride of Plymouth Lifetime Achievement Award 2009 that I was telling you about. Just want to say that today I have been very upset as I went to the funeral of my friend, Kiera. She was only 6 years old but she died suddenly a couple of weeks ago. I was so shocked when I was told as I was only playing pool with her a week before that. I was also told that I was to go into hospital today so that just about sent me in tears, but even though I am 18 I still feel for people, it will not be the same without her being there. But enough of that, like I always say, be POSATIVE ABOUT YOUR ILLNESS NOT NEGATIVE, but today was a down day for me, so please forgive me. Hi to all my Post Pal friends. Just want to share some good news with you. I have been nominated for the top 3 for the Pride of Plymouth Lifetime Achievement awards on Radio Heart! I could not keep it to myself and had to tell you as I am excited. If you listen to Heart radio, then as from the 2/11/09 you can vote if you want to. I hope that you are all OK but please remember that you should always be positive about your illness never negative. Well, although I am going into hospital next week for some treatment, I can also look on the bright side of things now. Anyway, I think of you all and say my prayers for you and hope to hear from some of you soon. Hello to you all. I would like to say a big thank you to a lady called Sarah who sent me a lovely letter – it could not have arrived at a better time as I’m feeling really poorly with a bad cough and chest. I think I might have to go into hospital as it really hurts when I cough. This is not like me as I am usually a happy lad, but for some reason I’m feeling down in the dumps and depressed. Anyway, enough about me. How are my Post Pals friends? I hope that you are all being positive about your illness, although I know it is hard some times, but I find it helps me to be positive not negative and I can get by like this. Well my mum and I are going to raise more money for Post Pals this Christmas by doing another tombola table and we’re hoping to raise lots of money for them. In the meantime, take care of yourselves and SMILE at the world. Hi everyone just a quick update to tell you that I have managed to stay out of hospital again this month. I went to the hospital yesterday and the doctor seemed happy with me. My weight has gone down a bit and lung function is still not good, but otherwise I am feeling ok, I’m just not looking forward to winter. Hope everyone else is doing well, take care of yourselves and be positive about your illness not negative, so I keep being told. Hi everybody I just to say thank you for my cards and gifts. Thanks also to Jane and Mark Beswick for coming down to see me in Plymouth. They brought my birthday gift and when I opened it I got a big surprise as it was a real fireman’s AXE mounted on a plaque and it is fantastic. I would also like to tell you that I have just raised £155 for the Cystic Fibrosis trust. I did a charity football match between the paediatric C/F doctors and nurses and the adult C/F doctors and nurses which also included the physios as well. Next, my mum and I are raising funds for Post Pals in December. I am also now a level 7 football referee so I am not letting my C/F beat me. Hi to all my friends on Post Pals. I would like to say a big thankyou to all who sent me cards and gifts for my 18th birthday. My first birthday surprise was the gift from my mum and dad and all the rest of my family – they had arranged for me to go to see my football team (Sheffield Wednesday) who were playing Plymouth Argyle and my team won 3-1. Best of all was that they let me be their mascot and lead them onto the pitch. I had lots of football stuff including a signed shirt and signed ball from my uncle, a ring from my nana and lots more. I had 62 birthday cards and some came from Post Pals and I am so happy that people can be so kind. Then in the evening I had a lot of people come to my birthday party and then someone who said they could not come turned up all the way from Kent. That person was one of the fire fighters from London fire service who I met when I was 6 years old through the Make A Wish Foundation. He drove down on my birthday to surprise me and what a surprise it was. Then he had to drive all the way back again the next day as he was on night duty. All in all I had a wonderful time with all my family and friends. Although I may now be 18 I still hope that you will remain in contact with me and I would also like to say well done to Stephanie and her husband Kevin in Utah who are supporters of Post Pals and have just had a baby boy called Trig. Once again, thankyou. We got to meet up with Jane, Mark and their children, since I last updated. They support Post Pals and they came down to Plymouth and gave Jon Paul his birthday present, which he hasn’t opened yet. He has also received some gifts from Post Pals, so thank you for his post. Thank you for all Jon Paul’s cards this month, plus the beautiful quilt he received and the gift of some fire badges and a poster from someone who wants to remain anonymous. Hello to all my friends on Post Pals and all the lovely people who made my quilt for me. It is so fantastic that I actually had a weep about it. It is truly awesome and will have pride of place in my bedroom. I cannot thank you all enough, there are some truly wonderful people in this world who help people and I am saying a prayer for all of you. Please take care. Many thanks for the post Jon Paul has received this month. Although I am in hospital and having I/V treatment today, I was allowed out for a couple of hours so that I could help my mum and friend Rachel raise funds for Post Pals. We have raised £85 by doing a tombola stall. Take care all of you and look after yourselves. Jon Paul will be going in to hospital on the 6th May for more IV treatment as he has an infection in his lungs. Thank you for all the post he has received. Thanks Post Pals for my word search mug, I’m having great joy doing the puzzles. Some of them are hard, some easy, but enjoying them all. They are a good gift and I truly appreciate all that you do for me and the other children who are suffering from illness. I want to wish all post pals and guests a very happy Easter and may God be with you through all you do this Easter. Thank you for my cards from everyone this month, to Percy the Poodle for the letters, and for the badges that were sent from Utah. Jon Paul is going in to hospital on Monday for 2 weeks. He would like to say thank you to all his Post Pal friends for their kindness and is thankful for all the post he receives. I would like to wish all my friends on Post Pals a very Happy New Year. Thank you for the cards and gifts from all the Post Pals friends who sent to me over Christmas. I am going in to hospital next week as i have been really poorly over Christmas with the flu, but it did not put a damper on anything and we still enjoyed ourselves. Just to say that I had a great time in London or should I say Bromley borough of London. I went to visit all my friends at the fire station and had a good time – I even went out on a shout to some people stuck in a lift. Then when we got back I went to inspect all the fire engines and went up in the sky lift. I was well looked after and even got to set some scents for the Fire Dog – he was great and found everything that I had hid away and I gave him a treat (his chicken that squeaks). We went to see Cinderella in the evening and met the stars of the show and got their autographs and had my photos taken with them. One was Steve Guttenberg from Police Academy and Helen Lederer who was in French and Saunders series on the television. So all in all I had a good time. Jon Paul has had another C/F Clinic this week are we are not happy about the outcome. The Doctor has said that because he has so much scaring on his bronchial tubes and lungs he is considering him for a lung transplant in the not too distant future. We are optimistic and just have to try and get his lung levels above 30, but JP being JP is always at 26/27 so we just take each day as it comes and try to get on with life. Jon Paul has refereed his first football match and he did very well. Thank you to everyone for Jon Paul’s post. For every card that he receives he sends a letter back to say thank you for their kindness. Just to let people know that Jon Paul is in hospital but doing ok at the moment. It is good to know that there are so many nice people around that care. Thank you to all who sent me cards and gifts while I was in hospital. It was very nice to know that there are such nice people in this world and I truly appreciate all that I received. POST PALS is a great organisation and I will continue to do my best and raise more money for you. Just to let you know that Jon Paul is back in hospital. He is very poorly and he has only been out of hospital a month. We went to CF clinic for a check-up and doctor said his lung function is only 27% and not good enough. Please feel free to write or email him as I think it would cheer him up. All I can say is let’s hope for the best and get him going on the right track again. Just to say I am out of hospital and back at home. I have put on some weight but not a lot. It’s enough to keep the doctor happy, although he said I could do with a bit more being added on. I am doing my last GCSE exam tomorrow then I have finished school until September. I am also writing to say that my friend Beki, who is also on Post Pals, is very poorly in hospital with her CF. We have both been on the same ward but are not allowed to see each other because of cross contamination between CF children. I want to ask if every one will send a prayer for her and hope she gets well soon. I speak to her mum every day so she is keeping me informed. Please help her as I know she needs it. I think the world of Beki and she has a lovely voice – when she sings it is like an angel. Jon Paul is poorly in hospital again. He had only been out for 5 weeks and now he is back again. He has lost more then 5lb in weight and is very chesty and his lungs sound like a baby rattle. He is also studying in hospital for his GCSE exams which he is now taking. He would like to say a big THANK YOU to all his friends who are sending him letters, he is always so chuffed to read them. We are hoping to raise some funds for Post Pals in the near future. Jon Paul will be out of hospital on the 11th February after being in hospital for 3 weeks and he is looking forward to coming home again. He has scared us as he was so very ill. He lost 6lb in weight and has been on 50% pure oxygen for 2 and a half weeks. His lung function has only been at 39% and doctors were really worried about him. A letter was sent to Great Ormond street to see about a transplant, but Jon Paul being Jon Paul, has pulled himself through again and has shown us all that he will not let his illness beat him. Thank you to everyone who has sent me cards, they are brilliant and I love them all. I am still quite poorly and I have to stay in hospital for another couple of weeks but the doctor said it is for my own good. I have to keep smiling although I do not feel like it at the moment as I am not very well. My cough and lungs are bad so I have to go into hospital 1 month early. The doctors are not very pleased with my lung condition and are worried about how ill I am. Jon Paul has been for his yearly check today. He has lost 8lbs in 3 weeks, plus his chest is very weak and he is finding it hard to breathe, so he is in hospital, he will be in over his birthday which he is sad about. He would like to say thank you to all that have sent him birthday cards, but he will not open them until his birthday. 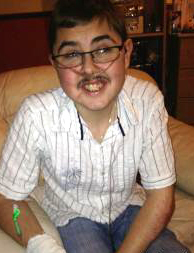 Hi everyone, just to say that Jon Paul is going to be 16 at the end of August and it looks like he will be spending his birthday in hospital, as he is very poorly yet again. Apart from that, he looked very chic at his sisters wedding in July where he was the chief usher and he had some girls chat him up, but he was not interested in them, typical boy. He has had some fire badges from Alabama from some fireman over there so that is now 148 fire badges from around the world, but he is still collecting more. Thank you to all the people who are sending him letters too, he enjoys reading them. Jon Paul now has the job of being a referee for the football team he plays with. He has his own referee outfit, whistle and plays by the book. Although he is still fire engine mad he is finding it hard to hear from any firemen. Today he has been admitted to hospital as he is very poorly. He is expected to be in for at least 3 weeks. Apart from that, he is still fighting and says that the C/F will not get the better of him. Keep up the good work and blessings to all of you. Just to let you know that I did not go to Lourdes in France as my doctor said I needed oxygen and it was too late to tell the air line we were flying with. I am feeling well at the moment and I am now looking forward to July when my big sister gets married, as I am going to be chief usher. First I have to do a 2 week course of antibiotics in hospital to get me in good condition. I’d like to say thank you to all the people who have sent me cards and gifts. I would like to wish everybody, especially all those nice people who send me cards and get well wishes, a very happy easter. I am fine at the moment, although have just spent 2 weeks in hospital, but am on oxygen at home now. Next week, fingers crossed, I am going to Lourdes in France with the Royal Navy group and I know I will have a good time. Jon Paul is in hospital and is on 50% oxygen, day and night. His lung function is only 84% at the moment and he is feeling very down about having to go in so early. He has only been out 8 weeks and was not due to go in again until the middle of April, so he is feeling upset. It’s best to get it over and finished though or he will not be able to go to Lourdes for Easter with the HCPT group. My consultant wants me to go into hospital 2 weeks early, even though I am not supposed to go in until the end of April, as my chest is very crackly and my breathing is not too good. Jon Paul would like to say thank you to everyone who has sent him cards and gifts.